← Entertaining Basics – Go Green! Happy Blogiversary to Me…and You! One year ago today, I wrote my very first blog post! I shared a baseball theme baby shower my SIL and I hosted for a good friend – and that baby will be celebrating his first birthday is just a few weeks! It’s been such a fantastic year filled with so many wonderful surprises along the way – from my dad being my very first subscriber (even before Mr. Lemon!) to having my parties featured on much larger party blogs that I follow and adore! And although being featured on other blogs is super exciting and leaves me with a huge grin on my face for a few days, I have the most fun planning events. I’ve felt so blessed to have people invite me into their lives and help make their celebrations even more special. Okay, enough gushing! This blogiversary most definitely wouldn’t have happened without all of YOU – I’m so appreciative for my blog readers who continue to check this little corner of the web for ideas on throwing parties! And because of that, for my blogiversary celebration, I want to have my very first giveaway! 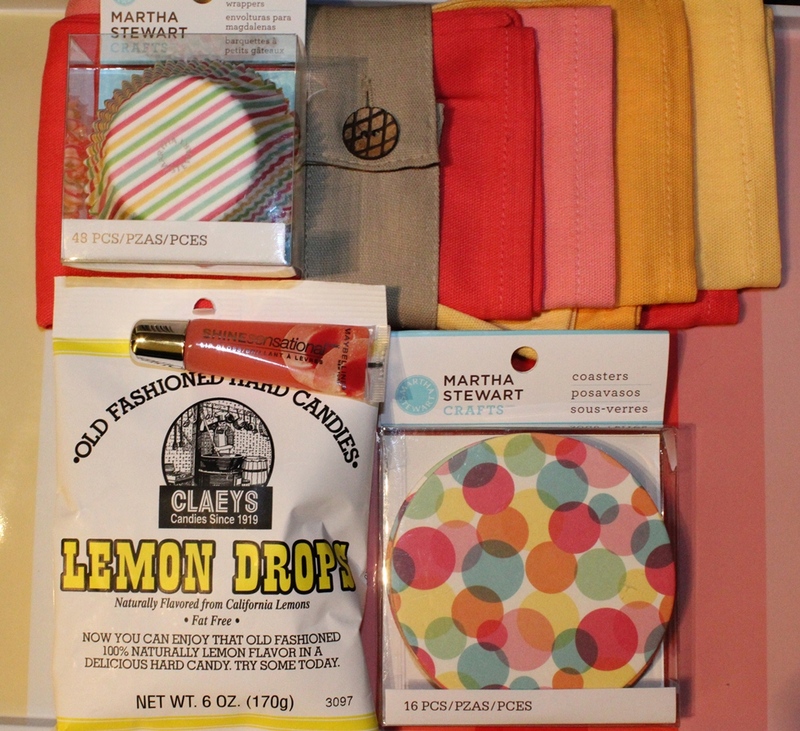 One lucky reader will be sent a little spring party pack featuring (quite coincidentally) the color of the year – tangerine! The giveaway includes cupcake wrappers and matching coasters from the ubiquitous Martha Stewart (I’ve been coveting these for a long time and I didn’t even buy a set to keep! 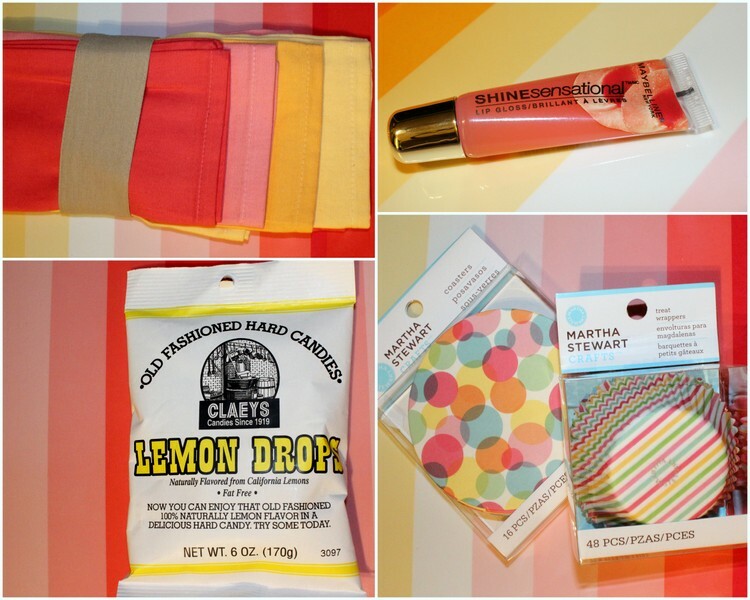 ), a set of four cloth napkins from Target, Maybelline lipgloss, and Lemon Drop candies (I just couldn’t resist! hahaha). *This giveaway will be open until Thursday, May 3 at 12am. The winner will be selected at random and contacted by email. *Sorry, this giveaway is open to US residents only. Good luck and here’s to another year on the blog! This entry was posted in Freebies, It's My life and tagged freebie, orange, yellow. Bookmark the permalink. 24 Responses to Happy Blogiversary to Me…and You! Congrats on your blogiversary, dear Rebecca! Or, should I say “Mrs. Lemon?” I am sooooo proud of you and your entrepreneurial (somebody please spell check that) success and your personal triumphs as well. You’re a special woman; one whom I’ve missed having in my life for TEN YEARS!!! Your blog and FB have allowed me to sprinkle you back into my life just a little bit, and it’s been super-fun. If we lived closer to one another, I would definitely hire you to help me whip up a dashing, daring, swashbuckling PIRATE PARTY for Jack Danger’s (yes, that’s his honest-to-goodness birth certificate name) 3rd birthday party this July. I will call it a success if no one goes home needing to wear an eye patch for REAL. Love you, Becca! Thank you so much Lindz! I’ve missed you so much, too. If you’re ever out this way, you can certainly bet that I will be planning a G/H reunion party! The next event I would love to throw is a mother’s day party. This is my “first” mother’s day with two babies and I would love to spend it with my mother and throw a great gathering. Congrats on being the mommy of two! It will be a fantastic day! Thank you! Loving the teal you’re incorporating into your living room! Happy Blogiversary! I’m already a Facebook fan and am looking forward to throwing a vintage tea party for my only daughter who will be 6 in July! Thank you! And happy 4th anniversary to you! I love looking at your Blog! So creative. My next event will most likely be a Pig Roast. Please pass along any ideas when/where you see them. I can use the help!! Best Wishes for continued success. Thank you Betty! I will keep an eye out! Hey hun, I’m not trying to win the Lemon Drops or the lip gloss, I just wanted to tell you congratulations. :-) Happy blogiversary! That party gift set would work well for Patrick’s birthday party. :) I’m think those colors would go really nice with beer! :) Anyway, Happy Blogiversary, Rebecca! I cannot believe it’s been a year. You jumped in with both feet and have done such a nice job. Keep up the good work! How about an 80th birthday party at a campsite on a lake. Congrats on keeping it going! Happy Blogiversary! I’m hoping to have a spring time BBQ soon. Can’t wait to get the grill fired up and dust off the porch! Thank you! I am so excited for grilling season, too! Hey rebecca, congrats, you were made for this! I was thinking about it a little bit and thought either a green clean party ;) or something to help support WAR international, women at risk! Thanks Jamie! And YES we need to do a green clean party!